It contains only the miirgui addon but no textures. I split up the two because the code is updated way more often than the textures. just change it to grey if you use the grey texture pack. Paste into your addon folder. If you have any problems, post in the comments section. copyrighted to its authors with all rights reserved. WarFront Warboards are now skinned. IslandPartyPoseFrame is now skinned. Yay. If you enabled the lootframes, you can now leftclick the bar to see which loot you could get (just like in the default ui. Didnt like the Azerite borders on gear. They look lke legendaries now! 'Titled'-quality followers now have a quality border and the correct color! Added a toggle to enable font outlines. If font-outlines are not enables, the game's default settings will be used. all alertframes should now have the same height and anchor better to each other. MiirGui Texture Pack Core is now an addon by itself! Performance should be better overall. Hey man. I have some issues using the Blue version of you great looking addon. 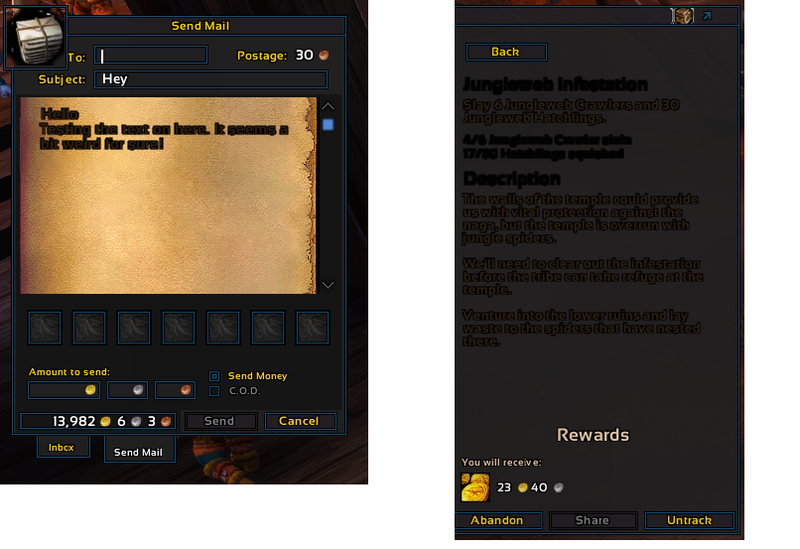 The text in ingame mails and quest text gets very black and very hard to read. I havent gone throug the trouble of disabling all my addons to check out if one of them is messing things up, but is it a common issue by any chance? Last edited by Miiru : 04-16-19 at 11:48 PM. I guess you could just use the garrison folder and not install the core addon, but there are many code-level changes for the garrison window so I doubt it will look good. Is there anyway that just use the Garrison Texture without load the Mirrgui Core ? Please try to download the new .zip I uploaded and unzip all those folders inside the .zip into World of Warcraft\_retail_\Interface folder. 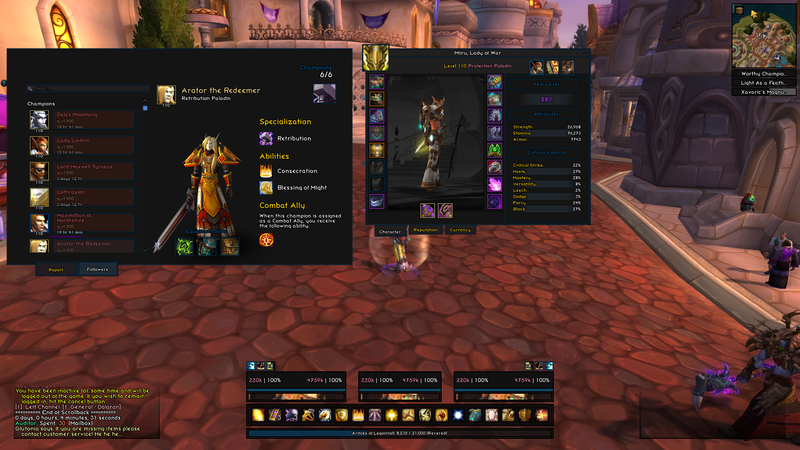 The miirgui core addon goes into the World of Warcraft\_retail_\Interface\AddOns folder. It doesn't seem to work for me. I get this neon-green borders around icons and other banners. I've added both the "grau" and the "miirGui" folders to my interfance\addons folder. What did I do wrong? Your files are fine. I meant to say that unzipping each file would overwrite the other. Thanks for clarifying. I guess I just zipped the parent folder instead of the /interface one. It is not possible to have both packs installed at the same time (without much work). Both Textures and Icons Installed? Can I have both the blue and gray installed? When I unzip the textures, they have a blau and grau directory, but both icon packs have a single ICON folder. I tried looking for this info, but could not find it. @BNS I edited the texture that is overlapping with the name on the trade window. 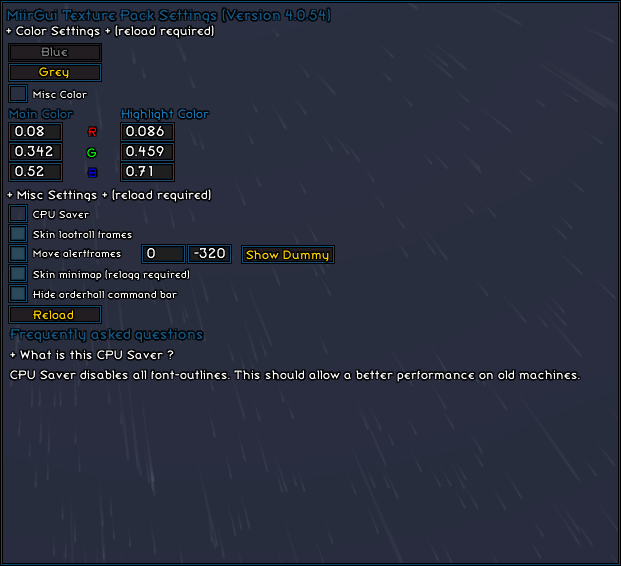 This texture applies to a lot of windows but this edit appears to have no downside in the small amount that I tested. Disclaimer: I only tested this with the Grey pack but they both appear to be the same, just different colours. I tried to find a clean way to do this without editing the texture directly but it altered the look of ui in game too much/was messy. It's possible @Miiru would've done something different, I'm not too experienced with the WoW API. I've just been messing around / cleaning up the grey textures for myself anyway. Thank you very much! My problem is solved! Last edited by Rubeek : 03-29-19 at 02:18 AM. After using this addon and texture pack(blue), whenever someone trades with me, the name of the other player cannot be displayed on the trading window. I can only see the avatar, is there any way to fix it? Last edited by BNS : 03-28-19 at 02:45 AM. 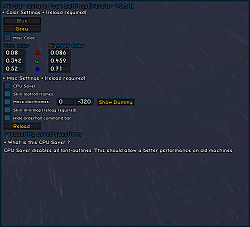 Hopefully @Miiru doesn't mind but I decided to fix that error myself, I also fixed the close button on the Azerite UI. That should work until Miiru releases an update. Thx. I included those fixes. I am struggling a bit with the subsription That free weekend was definately not long enough. Last edited by Rubeek : 03-24-19 at 11:07 PM. (*temporary) = "attempt to index local 'hideit' (a nil value)"
Last edited by Halona : 03-24-19 at 06:10 AM.